Can you wake up now, please? 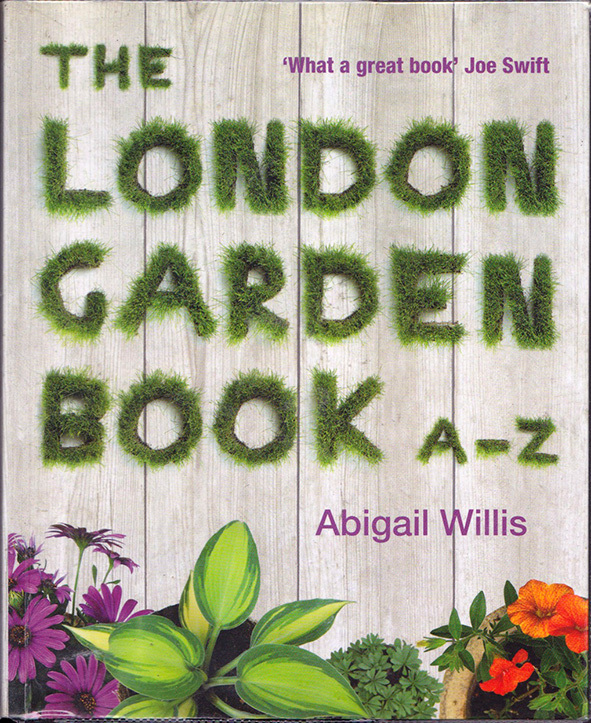 I popped into Charing Cross library last week and between playing “spot the sleeping person” and the “where’s the spare chair?”, I came across this great book in the gardening section. It’s an interesting read about gardens around the capital circa 2012. It’s been well researched and features everything from Kew, The Barbican Conservatory, beekeeping on top of The Royal Festival Hall to lesser known gardens like Roots and Shoots (where I did an introduction to beekeeping course with the LBKA a few years ago), The Food From The Sky growing project on top of a supermarket in Crouch End (sadly no more), Mark from Vertical Veg (who’s also well into his music), the Horniman Museum and Gardens (up the road from us who have a great annual plant sale) and even a traffic island in E9 that went to pot but now been planted out in a guerrilla gardening style, a great Zen garden in Acton and a whole lot more. Even Shannon’s our local garden centre is mentioned in it. What more do you want? 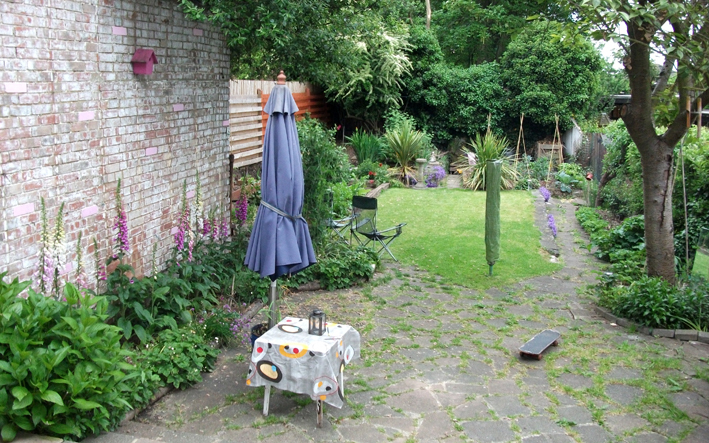 A great book documenting gardens in the capital from the big to the small! 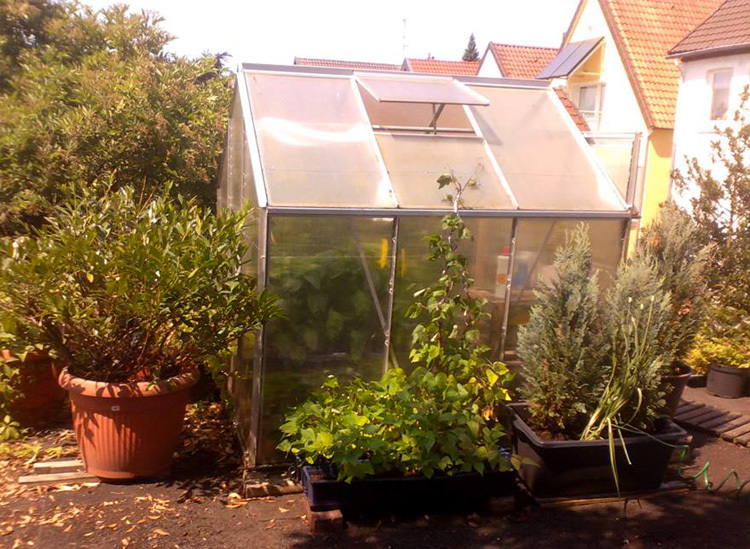 A big shout to Jochen of Splintercell Sound out of Germany for getting in touch and for letting us use some great pics of his veg cultivation. He’s been growing veg for a good few years in a limited space using minimalist techniques but still gets some great results (as these images show!) with the aid of his greenhouse and some tricks learnt along the way! Alongside growing other plants, he got fascinated with cultivating Bonsai. He read a lot about horticulture, studying books, blogs and online forums and did his first ‘experiments’ in the small yard of his parents house. After school he completed an apprenticeship with a breeder of agricultural seeds, studied horticulture for one year, worked at the Federal Research Institute of Nutrition and Food and now is studying Urban Planning. Sounds like a good grounding for this veg growing lark! 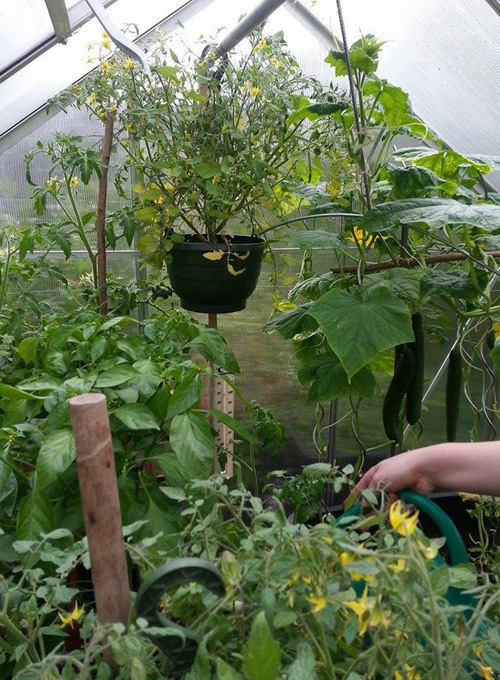 Most of the plants are grown in pots as he only has limited space and has a small greenhouse on top of his carport (above). As he says “it’s urban gardening!” Brilliant! He grows a lot of different vegetables and plants and always tries to use special strains and varieties. He told us one year nearly every plant was blue; blue potatoes, blue kohlrabies, blue carrots etc. Brilliant, well up my street as blue is one of my favourite colours but I am not sure what I think if it was served up on my dinner plate! 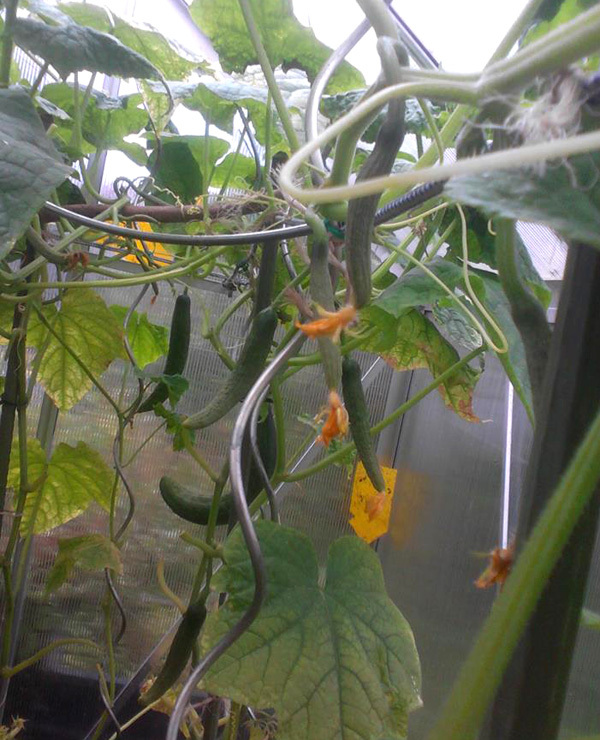 He also tries to grow something interesting like melons or special tomato or chili strains because of his limited space and he tells me that this years cucumber-harvest was amazing! I’ve only tried growing them outdoors twice and haven’t had much success but these below in his greenhouse look brilliant! Big up Jochen, his veg gardening and the splintercell sound! A view of the garden tonight taken while having a cup of char watching the Bees working their way around the Foxgloves on the left. It’s all starting to kick off growth-wise now! I was feeling a bit overwhelmed today as it’s been a busy old week but it was only while listening to Wilko Johnson being interviewed on Radio 4 who was sounding well chipper even though he’s terminally ill that put all my moaning into perspective! I’ve never been a massive fan of Dr Feelgood but did see them at the Lanchester Polytechnic in the late 1970’s. A bloke who was doing the sound that night told us the band were really late arriving and so drunk they were turned away by the door staff thinking they were a gang of cockney blokes on a stag-night. It was only when a fan who was in the queue told the bloke on the door “You can’t do that mate, they’re the band!” Brilliant! A big shout to our good gardening friend Scarlett (who also writes the excellent Heavenly Healer blog), who sent us an excerpt from her “Attracting Beneficial Insects” factsheet which she has kindly let us reproduce here. The following list applies to Bees and other beneficial insects. May/June – Aquilegia, Geranium, Campanula, Chives, Sages and Thymes, Wallflowers, Vipers bugloss, Birds foot trefoil and sweet peas. July/August – Lavender, Cornflower and Centaurea, Marjoram and Scabious. In general all insects love Sunflowers and Hollyhocks. Comfrey is great for the Bees (and for making liquid feed!) Monarda didyma, Linum, Agastache, Marjoram and Oregano, Astrantia, Thyme, Yarrow, Sage, Borage, Fuchsia, Geum, Cosmos, Poppy, Mallow, poached egg plant (Limnanthes douglasii) as well as climbing plants such as clematis and honeysuckle, are just a few examples in an exhaustive list. 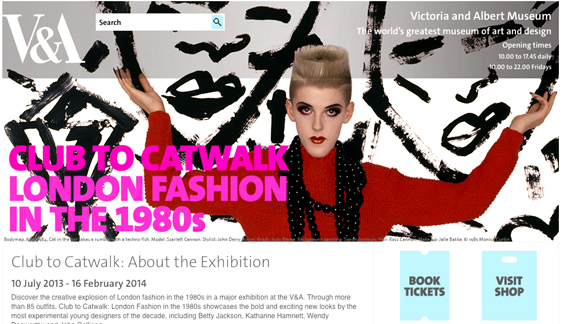 Scarlett also let us know of a great exhibition currently at the V&A called From Club to Catwalk. Great stuff and great photo! Thanks for the list and the exhibition info. We’ll pop down over the summer for that. Talking of the summer, can we have the sunshine back? Thanks to Teffany for letting us know about an edition of Radio 4’s Costing the Earth called “Bees Fight Back” about Bees and Neonicotinoid pesticides, which is worth a listen. While looking for it I stumbled across one called “The Bee Inspector” (still up on the web here) which gives a great introduction to the world of Bees and Beekeeping over four short programmes. It’s well interesting stuff even though it’s ten years old. Give it a whirl! Big up the ‘umble Bee!